One of the loveliest things anyone can do for us is to invite and welcome us into their life. To share at a deep level is trust revealed and given. And our response to it could make or break that friendship. Because there is a reciprocal response required. How about when it’s God issuing the invitation? Will we draw near to the Source of Life Himself? Maybe we will go to Him willingly if we appreciate the worth of this invitation. Or maybe we hesitate ~ wary, uncertain, or unwilling to follow. Since the beginning of this year God has been trying to get my attention. The ‘word’ He laid on my heart should have given me a clue as to His intentions. Yet my soul has pulled away and strayed more often than not from the simple call of “Come”. This week three words have repeated themselves:“Come to Me” and I know it’s time I listened and heeded them. I’ve really needed this reminder recently. As days get busier and more stressful I can’t afford not to go to God on a regular basis. He alone is the centre and oasis of calm in the midst of chaos. Peace in our pain and problems. Rest and refreshment in times of rush and hurry. Continual love and compassion for when we need a tender touch. Our patience and endurance when every last scrap deserts us. Hope in the hard places. Grace as we grapple to see our way forward. Light eternal to make the way ahead clearer. Maybe God is saying something similar to you too? Perhaps, like me, you sense Holy Spirit speaking to your heart. 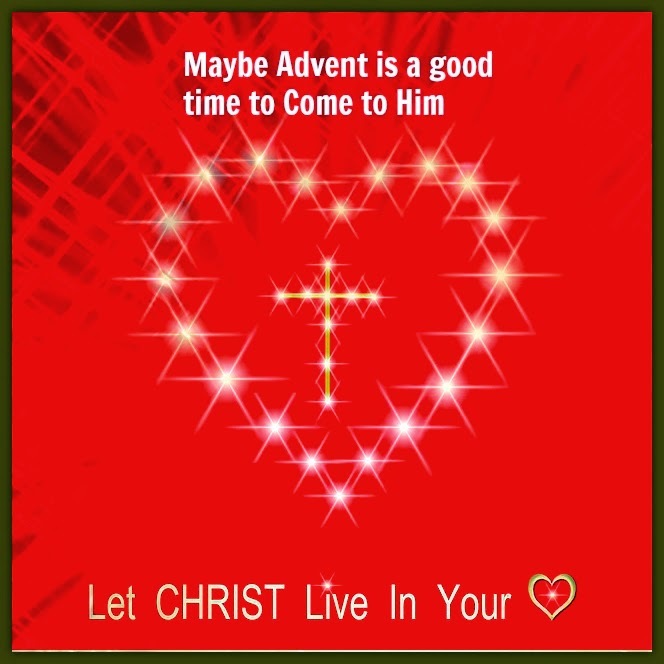 Maybe this Advent season is a good time to come to Him and let Christ live in your heart. **Note** ~ This poem is a rare one now on ‘Words of Joy’ as most of my poetry is being profiled on my new site poetryjoy.com ~ I’d love you to hop over and take a look. I realized this week how utterly dependent I am on Him. This is a lovely reflection Joy, nice to visit you. Just beautiful, Joy! The whole post! But your poem, so real! I can hear God calling! Such a beautiful poem. You include so many reminders about what Advent means. It is such a fight to stay authentic when the nature of this season pulls so hard at keeping us busily on the surface. May quietude and peace find you this year! Hi Karin, I agree with you when you say, "It is such a fight to stay authentic when the nature of this season pulls so hard at keeping us busily on the surface". Oh yes, indeed! Yet God is asking is to go deep, dig in and savour the full meaning and implications of Advent. It runs completely against the tides of trimming and tinsle, the gloss and glitter that is only superficial. The Christmas message is for the whole year, not just for a season. So sorry I'm just now coming by, Joy. "Grace as we grapple for our way forward." Oh how I love that. That is meaningful to me right now. Thank you for the beautiful poem.